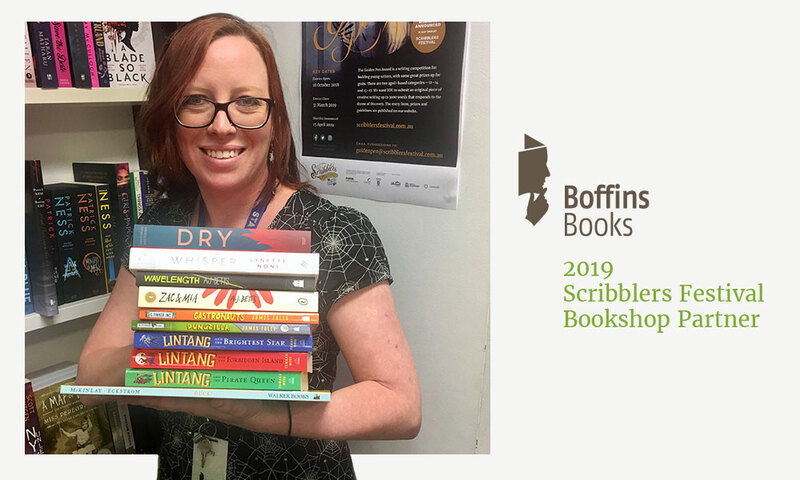 The Scribblers Team is delighted to welcome Boffins Books as our bookshop partner for the 2019 Scribblers Festival. Boffins will set up a dedicated bookshop on site during the Festival, from 8-12 May, to make sure our wonderful guest authors’ titles are easily available to audiences. We can’t have a book festival without books after all! Boffins is one of many marvellous independent booksellers in Perth who continue to pass on the joy of reading to customers of all ages. There really is nothing quite as reliable as sound advice from an enthusiastic bookseller when it comes to choosing a good book. Which guest authors of Scribblers Festival 2019 are you most excited to meet in May? I’m actually really excited for the Through the Glass Darkly session as dystopian fantasy and sci-fi is a favourite genre of mine. I’ve met Lynette Noni before and really enjoyed talking to her. I am looking forward to hearing AJ Betts and Neal Shusterman alongside her and the art of world building. Honestly, my favourite thing is the customers. Being able to talk to people about children’s books makes me feel happy and sharing recommendations with kids is really fulfilling. I love it when my regulars come back for more and tell me what to read as well. We are independently owned so it feels more like a family than a store. We hand pick the titles we sell and research them thoroughly to make sure we give the right advice and try to find the perfect book for each and every customer. Lintang and the Brightest Star, the third in the series by Perth author Tamara Moss. You can’t go wrong with a good pirate adventure! Aimed at primary school readers, this series is full of action, mythology, magic and themes of friendship and finding one’s purpose. I love them and they are the perfect book to recommend because they suit a range of readers. I think my all-time favourite childhood stories were the ones my dad made up for me and my brother when we were little. When I started really enjoying books, I was definitely an Enid Blyton fan and we had an old book of fairy tale re-tellings with a spectacular version of Cinderella that sparked my interest in collecting fairy tales which I still do today. If you could choose a famous book character to have dinner with, who would you pick? I think Skulduggery Pleasant would be pretty cool to hang out with. I don’t know if he could eat dinner though, being a skeleton…Percy Jackson would be amazing. I love mythology and he’s been in some pretty exciting adventures! Definitely the new #loveOzYA anthology due in December and Wundersmith, Book Two of the Morrigan Crow series by Jessica Townsend. I’ll also be revisiting some old favourites in my fairy tale collection, including Sea Witch by Sara Henning. I’ve got a couple of customer recommendations too that I want to get stuck into. Details of The Scribblers Festival Schools Program can be downloaded here Our full family program will be released in March.